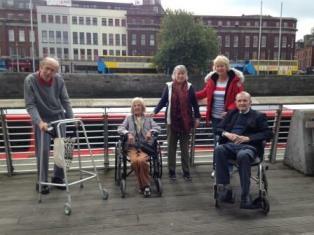 We encourage all residents to participate in weekly activities and trips organised to local places of interest. 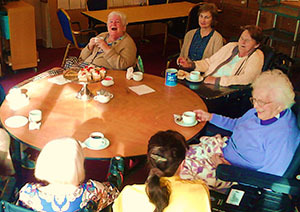 Our experience is that residents really enjoy our stimulating programme. The programme may include an in-house movie screening, art & crafts, games, barbeques, shopping, external afternoon tea, park walks, concerts and theatre trips, to mention but a few. 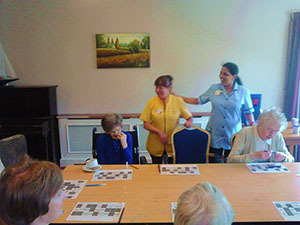 Our weekly bingo is also a great way for our residents to unwind and socialise with their fellow residents. Our travel vehicle is wheelchair accessible. Our garden at the rear of the building is also an excellent amenity available to all residents and family. TLC Santry are organized for you regularly to places such as Croke Park, the Theatre, shopping centres etc. There are barbeques held during the summer months. Live bands and musicians and Grand Canal Theatre are booked on a regular basis to provide resident involved entertainment. In addition to your TV in your room there is larger screen TV’s in the sitting rooms that are used to show events and films. There is a reading room with a large number of books to meet the varying tastes of residents. 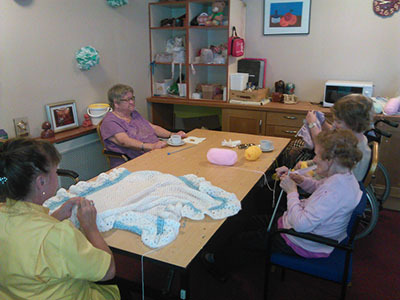 Pet therapy group attend on a scheduled basis throughout the year. We value the importance of family and friends involvement in your life and warmly invite them to visit you and avail of our facilities in the restaurants and family rooms. Family members are encouraged to attend during meal times to assist with eating and drinking and are welcome to enjoy mealtimes with the resident.